Join the likes of Disney, Booking.com, Hubspot, Twitter, YP, Microsoft and others who have invested in building out their product analytics stack. The world of product development is changing rapidly. Twenty years ago, “online” was a new acquisition channel. But today, online is the product. And all companies are turning into digital product businesses. However, the fact that software is eating the world shouldn’t be surprising to anyone reading this. But how quickly it’s happening might be: over half of all Fortune 500 companies since 2000 no longer exist. Those that survive now move faster than ever before, leveraging trends in product development like agile, devops, microservices, continuous integration and autonomous testing to go from quarterly release trains to multiple releases per day. In 2005, “online” was a new acquisition channel, now it’s the product. In this world of rapid development, releasing new products has become so easy that an explosion in product offerings has occurred, leading to the “Age of the Customer”. Product teams must now have the capabilities to keep up with these increasing customer demands or risk falling into irrelevance. The good news is that for the first time in history we can measure practically every interaction a customer has with our business. Companies are no longer constrained to traditional marketing analytics like simple counters or conversion funnels but instead can leverage data to truly understand user behavior. Successful teams can use this understanding to be more reactive to changing demands from customers, further powering agile/continuous product development processes and creating insanely tight OODA loops that lead to better and better products. Successful teams make rapid decisions together. The problem is that the legacy data and analytics tools in the marketplace aren’t capable of meeting the needs of these high-performing product teams. Marketing analytics tools can answer questions regarding where a user was acquired or how many have traversed each stage of an acquisition funnel, but fall short when you want to understand what those users are doing in your product, or how usage of one or more features impacts overall engagement/conversion. Data warehouse tools on the other hand are flexible enough to answer almost any question, but suffer from significant drawbacks that reduce their effectiveness within a product organization: high levels of maintenance, poor ease of use and long query times. The legacy analytics industry doesn’t address today’s product needs. But because no solution existed historically, companies were forced to answer product questions by hacking together multiple solutions, which ended up creating a complex analytics stack that is only accessible to the most technical teams as illustrated below. An analytics stack is the different applications, data warehouses and data pipelines that solve analytics use cases for your company. Complex data stacks restrict access from all but the most technical. Data pipeline. The major problem here is that there’s only a select few people in the organization that actually even understand what is being tracked. If you’re not one of those lucky people, you have to go find them. And heaven forbid you actually want to change that tracking - you’re going to have to coordinate through multiple people and multiple code pushes to make that happen. Query Environment. This pain then extends into the query layer, where, because multiple datalakes/warehouses exist, no one knows where to go to answer even the most basic questions like how many active users do we have or what is the conversion of our onboarding funnel. And because those warehouses are not custom built for user-behavior questions, even if you know how to query them, they still suffer from poor latency. And if you don’t know SQL? You have to find an analyst who does, which means they’re taking their time answering these very basic questions. And your engineering team? They’re spending valuable time maintaining all of these systems versus actually building a great product. Data Exploration. Finally, we get to the exploration layer, where PMs wait in long data breadlines that cause iteration cycles to take days if not weeks of time. And yes, analysts will build out dashboards to answer some of the most common questions, but dashboards are really only about consumption. The moment you want to drill down into the data, you’re right back in the breadline, kicking off the iteration cycle again. And this is really a best case scenario - more often than not the questions just aren’t asked, leading to people shooting from the hip and making the wrong decision. So why does this happen? Obviously no one is intentionally building a poor analytics stack, but what they are doing is force fitting legacy technologies in an attempt to answer user behavior questions. However, the best in class product teams have instead augmented their existing marketing and data warehouse tools with a product analytics stack to ensure that everyone has self-serve access to user behavior data. Best in class companies have a product analytics stack accessible to all users. Marketers and PMs can ask and answer questions directly, leading to more and better questions and the conviction to make product decisions quickly. Analyst and data scientists are now freed up to work on higher order problems. Engineers no longer have the burden of maintaining a complex data infrastructure and instead can focus on the company’s core competency of building a better product. So what does this look like in practice? Here’s an example of one of our customer’s stacks that helped them undergo a digital transformation. An example of a best in class digital analytics stack from Yellow Pages. Having this stack has enabled Yellow Pages Canada to decentralize their product development efforts. Teams are now able to move much faster because they can define their own analytics requirements: determine and manage the events they want to track, define their own KPIs and explore day-to-day metrics directly. This has eliminated the data breadline bottleneck. And as an added benefit, because product teams fully understand their user behavior data, they are now asking much more advanced questions of the data analytics team leading to much deeper insights than ever before. 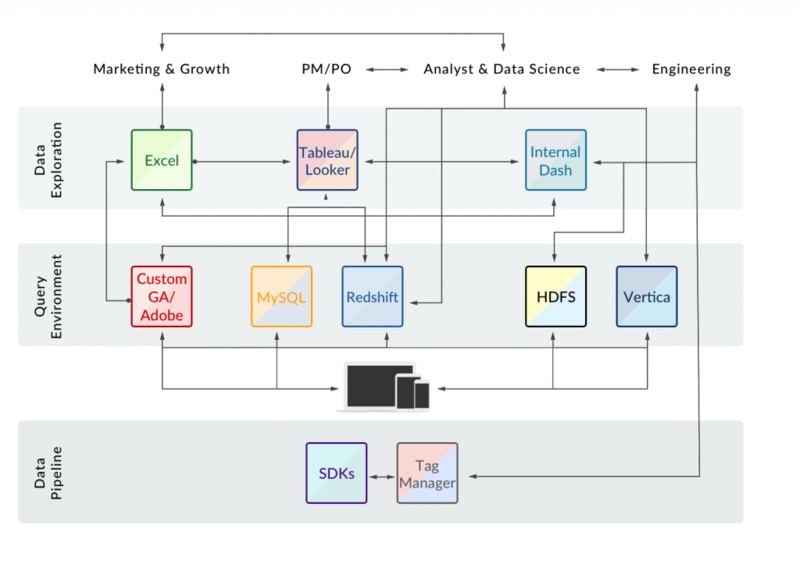 So, how do you know if it’s time to invest in a product analytics stack? If you find yourself in a competitive situation where speed to insight is critical to driving success. If your product teams are using legacy marketing analytics solutions and are therefore limited to basic funnels and pageview metrics. If your analysts/data scientists are becoming bottlenecks to the product org, slowing down development efforts or causing teams to ‘shoot from the hip’. If you answered yes to any of these questions, we’d encourage you to join the likes of Disney, Booking.com, Hubspot, Twitter, YP, Microsoft and others who have invested in building out their product analytics stack by reaching out!